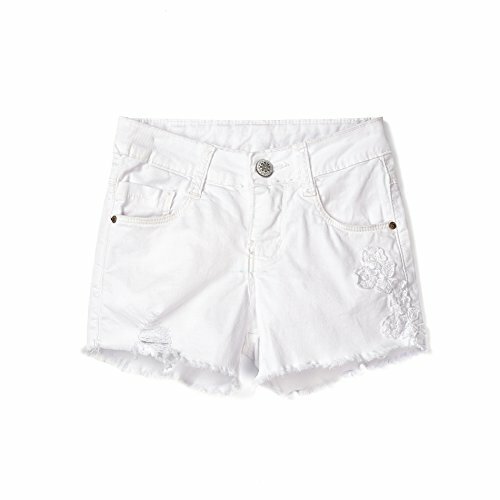 Isped girl's denim decorated and available in multiple colors shorts are a comfortable, stylish addition to your girl's wardrobe. Made of soft and stretchy denim for a great feel and easy to pull on, they are just what a fashionably conscience girl needs for the hot days. 3.Breathable, material provides the perfect feel, keeping her cool during the warm summer months. 4.Perfect fit for your little girl, stylish soft stretch fabric design, adorable embroidery details, and with broken trim, great for daily wear. Please Reference the Variations for All Available Sizes & Colors! Isped stylish options that offers premium clothing at affordable Prices because we value every customer that visits our listings! You may like to go our storefront to see the rest of our great deals. We're confident you're going to find items you will absolutely love and adore! If you have any question about the shorts, please contact with us. Your satisfiction is our top priority. Cleaning: Hand-washed or machine-washed and hung up to air dry. These girls summer clothes ensure a great fit and take the guesswork out of shopping online. The girls summer shorts also come with elastic at the waist to ensure a snug yet comfy fit.